You will always remember how special God's love is with this "For God so Loved the World" diamond cross necklace in 14K white gold, inspired by the most famous Bible verse of all time, John 3:16. The pendant measures 3/4 inch tall and 0.55 inch wide, and has a stunning looping design that has diamonds swirling around the arms of the cross. The 19 diamonds that are on the pendant are rated G-H color quality and I1 for clarity, and total 0.10 carats. The beautiful pendant also comes with an 18 inch cable chain necklace. 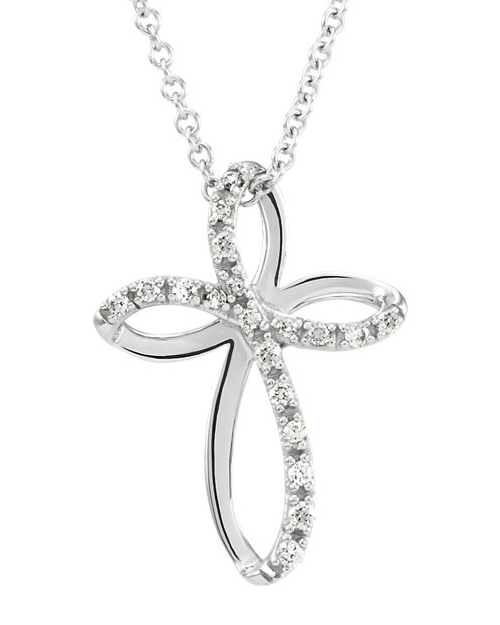 We guarantee our For God So Loved the World Diamond Cross Necklace to be high quality, authentic jewelry, as described above.